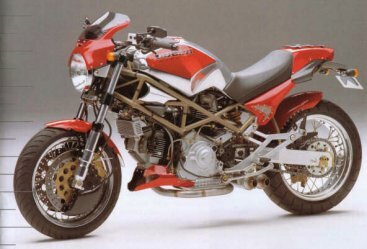 When Miguel Galluzzi designed the original Ducati Monster in 1991, it took the motorcycling press a while to absorb what he had done. 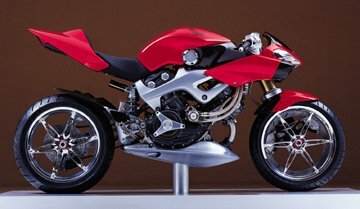 Of course, the design was quickly praised, and has had a tremendous influence on motorcycling. Indeed, even today, we see new motorcycle designs migrating towards the Monster. Two of the biggest categories in motorcycling today, naked bikes and power cruisers, seem to be moving towards the Monster look and essence. Monsters are highly coveted by their owners, and frequently customized (look at the Monster on this page, for instance). Think about it. Both cruisers and naked bikes owe much to Galluzzi’s original creation. Even the Sachs beast, and Honda’s New American Sports (also pictured on this page) show a decided Monster influence.